Thirdhand smoke is residual tobacco smoke contamination that remains after the cigarette is extinguished. 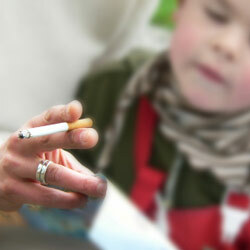 Children are uniquely susceptible to thirdhand smoke exposure. The objective of this study was to assess health beliefs of adults regarding thirdhand smoke exposure of children and whether smokers and nonsmokers differ in those beliefs. The study, published on the Pediatrics Website in December hypothesized that beliefs about thirdhand smoke would be associated with household smoking bans. Data were collected by a national random-digit-dial telephone survey from September to November 2005. The sample was weighted by race and gender within Census region on the basis of US Census data. The study questions assessed the level of agreement with statements that breathing air in a room today where people smoked yesterday can harm the health of children. Overall, 95.4% of nonsmokers versus 84.1% of smokers agreed that secondhand smoke harms the health of children, and 65.2% of nonsmokers versus 43.3% of smokers agreed that thirdhand smoke harms children. Strict rules prohibiting smoking in the home were more prevalent among nonsmokers: 88.4% vs 26.7%. After controlling for certain variables, belief that thirdhand smoke harms the health of children remained independently associated with rules prohibiting smoking in the home. Belief that secondhand smoke harms the health of children was not independently associated with rules prohibiting smoking in the home and car. The study demonstrates that beliefs about the health effects of thirdhand smoke are independently associated with home smoking bans. Emphasizing that thirdhand smoke harms the health of children may be an important element in encouraging home smoking bans.